There were a record 43.7 million immigrants living in the U.S. in 2016, making up 13.5% of the nation’s population. This represents a more than fourfold increase since 1960, when only 9.7 million immigrants lived in the U.S., accounting for just 5.4% of the total U.S. population. Click on any of the images below to see the full chart and data. 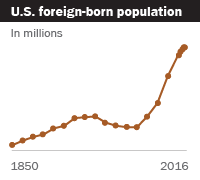 The foreign-born population residing in the U.S. reached a record 43.7 million, or 13.5% of the U.S. population, in 2016. This immigrant population has more than quadrupled since the 1960s, when the 1965 Immigration and Naturalization Act took effect. Though growth has begun to slow in recent years, the number of immigrants living in the United States is projected to almost double by 2065. Note: "Other Latin America" includes Central America, South America and the Caribbean. Source: Pew Research Center tabulations of 1960-2000 decennial censuses and 2010, 2013-2016 American Community Surveys (IPUMS). The regions of origin for immigrant populations residing in the U.S. have dramatically shifted since the passage of the 1965 Immigration and Naturalization Act. In 1960, 84% of immigrants living in the U.S. were born in Europe or Canada, while only 6% were from Mexico, 3.8% from South and East Asia, 3.5% from the rest of Latin America and 2.7% from other areas. Immigrant origins now differ drastically, with European and Canadian immigrants making up only a small share of the foreign-born population (13.2%) in 2016. South and East Asians (26.9%), Mexicans (26.5%) and other Latin Americans (24.5%) each make up about a quarter of the U.S. immigrant population, followed by 8.9% who were born in another region. Since 1980, the share of immigrants who are proficient in English (those who speak only English at home or speak English at least “very well”) has declined, though it has increased slightly in recent years. 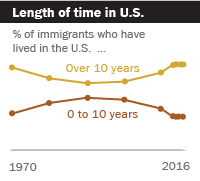 This decline has been driven entirely by those who speak only English at home, which fell from 30% of immigrants ages 5 and older in 1980 to 16% in 2016. The share who speaks English “very well,” meanwhile, has increased slightly, from 27% to 35% over the same time period. Among the nation’s immigrants, Spanish is by far the most spoken non-English language (43% of immigrants say they speak Spanish at home), but it is not the only non-English language spoken by immigrants. 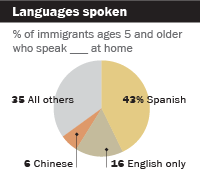 Some 6% of immigrants speak Chinese (including Mandarin and Cantonese), 5% speak Hindi or a related language, 4% speak Filipino or Tagalog, 3% speak Vietnamese, 3% speak French or Haitian Creole and 2% speak Arabic. While immigrants account for 13.9% of the U.S. population, the U.S.-born children of immigrants (second-generation Americans) make up another 11.9% of the nation’s population. By 2050, these two groups could account for 19% and 18% of the population, respectively, according to Pew Research Center projections. Starting as early as 2010, more Asian immigrants than Hispanic immigrants have arrived annually in the U.S., a reversal of historical trends. In the early 2000s, the number of newly arrived Hispanic immigrants greatly outnumbered newly-arrived Asian immigrants. Around the time of the Great Recession, Latin American immigration declined sharply, especially from Mexico. Education levels among the nation’s immigrants have been steadily rising since the 1960s, just like the native-born population. While there have been gains across the board, the increases have been most dramatic among immigrants from Asia, Europe and the Middle East and less so among those from Mexico and Central America. Note: Shading shows range of estimated 90% confidence interval. Source: Pew Research Center estimates based on augmented U.S. Census Bureau data. See Methodology for details. 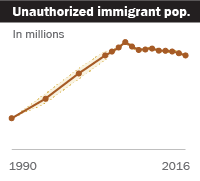 The nation’s unauthorized immigrant population grew rapidly between 1990 and 2007, reaching a peak of 12.2 million. Since then, the population declined to 10.7 million. 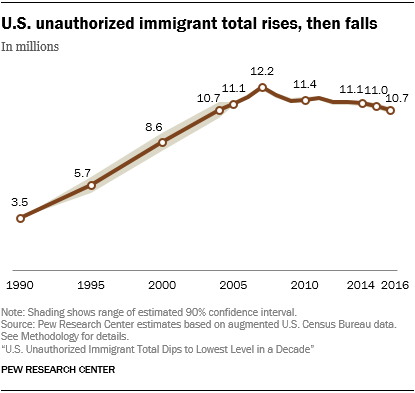 Unauthorized immigrants from Mexico make up half of all unauthorized immigrants and have been a driver of the group’s population decline – the number of unauthorized immigrants from Mexico fell from a peak of 6.9 million in 2007 to 5.4 million in 2016. 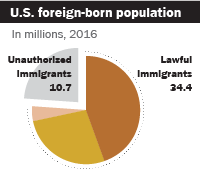 About one-quarter of the U.S. foreign-born population is unauthorized immigrants, while the majority of the nation’s immigrants are in the U.S. legally. 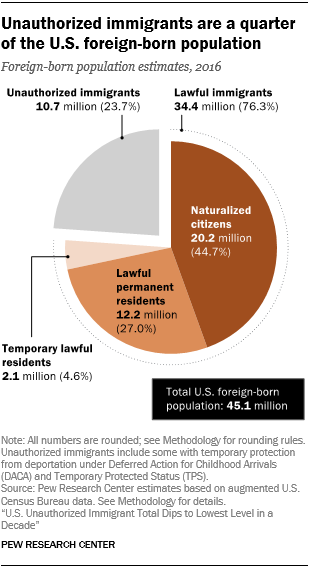 Naturalized citizens account for the largest portion of the foreign-born population (44.7%). 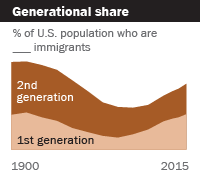 The age structure of the U.S. immigrant population has changed alongside the changing immigrant origin regions. As the largest group of immigrants shifted from Europeans and Canadians to Mexicans, the largest age group moved from ages 65-69 to ages 40-44 in 2016. Today, European and Canadian immigrants tend to be older, with a median age of 52 in 2016. 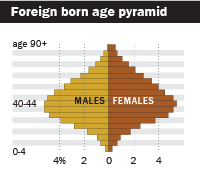 Mexican immigrants are among the youngest, with a median age of 42. 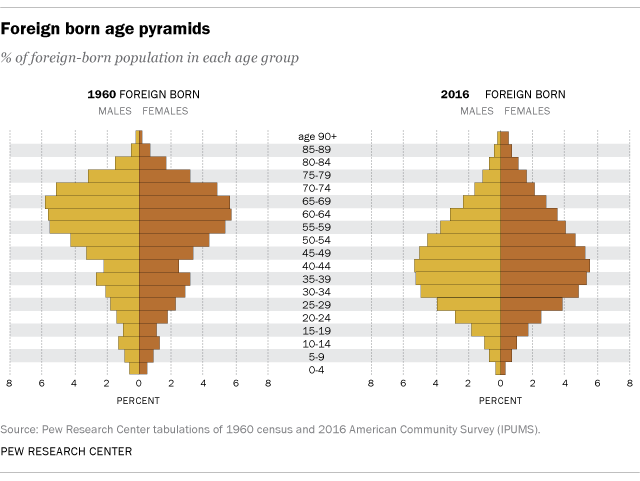 The age distribution of the U.S.-born population has also transformed. 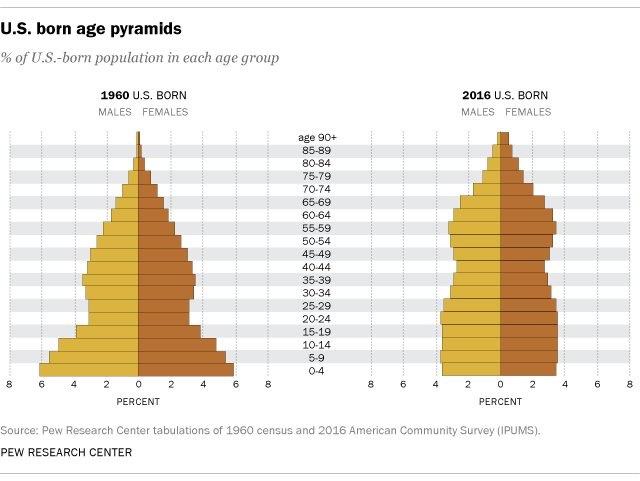 In 1960, the late years of the Baby Boom generation, the population was younger than in 2016, when these age groups were much more evenly dispersed.